On Friday, I sculpted the Blue Marlin mural. 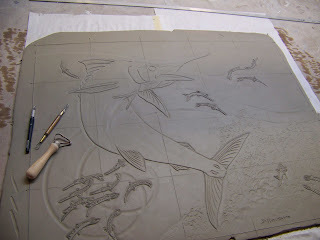 I layout the clay in a slab 10% larger than the finished mural. This to allow for the shrinkage of the clay. I use a ribbon tool to sculpt the design into the wet clay. When it is firm but still soft, I cut it into tiles. The mural will now need to stay under plastic cover for a day to allow the tiles to get dry enough to handle. Monday I will uncover the mural and let dry. Still a long way to go.